Red-eared slider left. Yellow-bellied slider right. The size difference is probably due to their different ages; when I first saw them I thought they were parent and offspring. Click to enlarge. 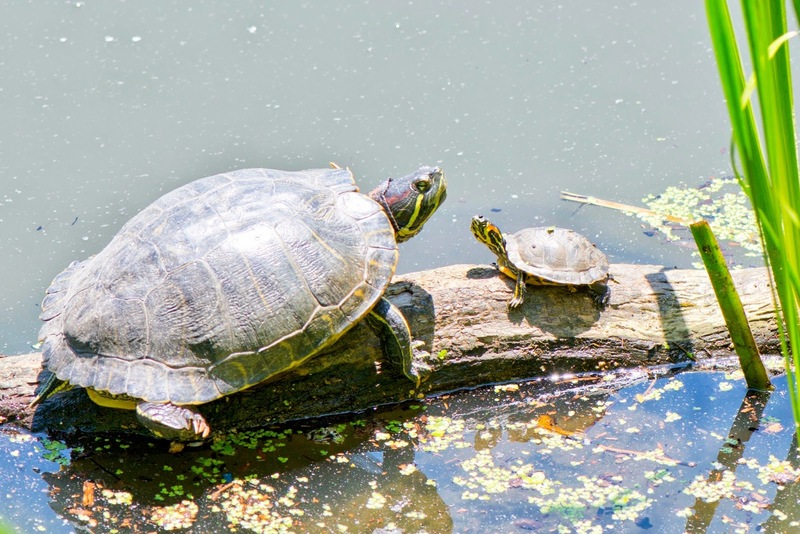 I saw a yellow-bellied slider turtle, Trachemys scripta scripta, in the lake in Central Park last week. I have never seen one there before. I see red-eared sliders, Trachemys scripta elegans, every time I pass the lake from spring through autumn; red-eared sliders are common and widespread. The two turtles are conspecific subspecies, close relatives of the same genus and species. Neither are native to this part of the country but are native to the southeastern states. They are both popular pets, though, and consequently show up in unexpected places. Humans probably released these turtles or their ancestors into the lake. The turtles seem right at home and are basking contentedly now.